Last year my lovely wife and I started the “20 in 2010” book challenge with the obvious goal of each reading 20 books in a year. Well, we brought it back again in 2011 and here is how I made out. 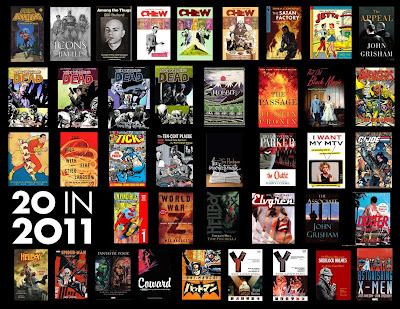 Like last year (and every year of my life), I read a lot of comic collections and art books. In 2010, for every 10 of those types of books I allowed myself to count one book to my list because it wouldn’t be fair to Heather who doesn’t read those kinds of books. This year I read 17 “actual” books (prose, novels, whatever) and 23 comic type books. After applying my highly scientific formula, my final count is 19. So, so close. Heather ended up at 11. In her defense, she is with a toddler all day, every day and doesn’t have as many little free moments to read a few pages here and there like I do. I can read during my lunch hour while she’s at home trying to convince our kid to eat a sandwich. We’re definitely bringing it back for 2012. We already have a stack of books waiting.